According to research published on CMO, it has been observed that the shopping experience for an approximate of 1 million customers shall be serviced through virtual reality. This has been predicted by Gartner as future technology trends 2020. It also has been predicted that customer support for products and services shall amount to 85% approximately by artificial intelligence. This also counts as trends for IT in 2020. Also, it has been predicted that artificial intelligence or AI shall form the backbone of software and technology. Here are some fifteen technology trends predicted by people in 2020. All these sectors involve contact with water, land, and air and thus enabling automation for all these mediums with a combination of virtual assistance. But this does not mean that humans end up losing their jobs. Artificial intelligence shall only act as a virtual assistant in future technology timeline. With the growing demands, the need for analytics for various sectors is also growing. This means that data scientists shall have a lot on their plate to analyze and provide related research and literature for secondary users. According to research, it has been predicted that for the assistance of data scientists, automation shall enable assistance of 40% approximately by 2020. This also derives global trends in 2020. This particular trend is a combination of the above trends which define development in various economies due to the use of artificial intelligence or the AI for research and assistance to various sectors of the economy. The development of Artificial Intelligence shall also help in deriving the business technology trends in 2020. 4. Congrats! We are going to have twins! Twins in the context of technology shall imply to digital twinning of an operating system, digital process, or even a tangible object. A robust combination of BigData Analytics and Artificial Intelligence which intends to create a dynamic structure for enabling opportunities for various enterprises. This involves empowerment of technology in such a way that the edge feature shall be used to compile, process, and modify information pertaining to the sources of the information provided. However, for enabling such a future computer technology 2020, a huge amount of expenditure shall be invested for enabling Wide Area Network for providing a seamless and hassle-free facility. However, devices supporting the edge technology are expected to include features like storing, sensing, computing, as well as the assistance through Artificial Intelligence in various sectors towards 2028 approximately. This has also been predicted by Gartner as one of the technology future predictions in 2028. According to statistics, the use of such technology shall be experimented by 70% of businesses approximately by 2022. This piece of technology was developed for the financial transactions with all sources including secured as well as unsecured ones. This technology includes a dynamic and virtual financial book or ledger which maintains records of all financial transactions which have taken place. This particular technology enables all banking or financial transactions without the participation or interference of a bank. According to statistics, it is predicted that the business value shall scale up to an approximate of $3.1 trillion by 2030. The development of cities that have a high level of smart quotient in terms of technology and humans are termed as smart spaces or smart cities. Such cities work completely through mobile applications and technology. The quality of the mobile network and internet provision is seamless and hassle-free. All the related activities take place through just a click on the Smartphone whether Android or iOS. The smartly built cities in terms of technology are predicted to grow in the coming years. With growth and development in technology, there also comes a threat of hacking or breach in cybersecurity. But using all the technological facilities ethically and consciously shall help in maintaining a strong and robust global community in terms of business. All such software and technology are predicted to have stronger protection through passwords and suitable encryption which are difficult to hack or breach. This type of computing and is a bit complex in terms of its functioning. And just like the name, this computing facility functions through the concept of quantum. And this occurs in the form of subatomic elements resembling that of physics. This category of computing is massive and dynamic as compared to traditional computing and has been predicted to drive changes in all related industries. According to research, it has been predicted that the development and service provision of a faster version of telecom service in terms of internet and calls shall be improved by 2020. This is an example of edge technology which shall involve higher costs of the facilities provided in terms of services for internet and calling. There are a few more trends which derive the development of technology in the future. According to the predictions of the Millennium-Project, there are going to be individuals who are going to retain their employment status and use a combination of Artificial Intelligence and Virtual Reality for their assistance to work in sectors of Biotechnology. There are also going to be freelancers who are going to use the same combination of futuristic technology and grow their businesses. It is further predicted that this is going to affect the Gross Domestic Product to grow by an approximate of 3 percent. This is one of the future technology predictions 2050. As per the research, an approximate of 7 to 10 trillion shall be invested in 2020 for creating new variants of technologies which shall assist businesses of healthcare, media, education, farming, and other such sectors of the economy. However, it is predicted by the Millennium-Project that the contributions of network technologies shall not be significant to affect the life in 2050 technology and affect an approximate of 1 billion lives. There shall also be a threat of terrorism in terms of crime and bioterrorism and will approximately take 25 billion lives from 2030 to 2050, as per the Millennium-Project. With part one of the recession phases in the year 2009, shall take to its sequel in 2021. This, in turn, shall promote economies developed out of new technology and investments into various formats of income which are guaranteed from the economy. However, there was a financial control mechanism in the place which helped the economy to bounce back on its road to development. With new technology, come new challenges. There are additional taxes attached for every facility used such as Artificial Intelligence, Virtual Reality, or even Network Technology. Employment scarcity in European countries and related problems shall make an obstacle for people to afford resources such as medicines, fuel, educational services, transport, and other such sources for maintaining a livelihood. According to the statistics, it is also predicted that individuals shall have to wait until the year 2030 for gaining out of income from government sources along with their basic pay. The Millennium Project has also predicted that there shall be an approximate of a quarter million of robots which shall be augmented to perform tasks pertaining to farming, agriculture, production and manufacturing, and other such related sectors of the economy by 2025. The climate and weather department shall also create new employment opportunities for people along with the use of Artificial Intelligence and Virtual Reality for analyzing the climatic temperatures and predictions for natural disasters if any. With the previous history of scams pertaining to the second generation of telecom network, there needs to be a regulatory body for telecom network in a way that all the users in the economy should get to benefit from the facility at affordable prices and network quality. This shall also help people develop relative software which shall help in eradicating diseases or disorders through the air. And this shall occur by 2030. As organizations helped people in getting their certifications, diploma, and degrees to retain them, it became quite unnecessary by 2035 to do so due to developed technology pertaining to Artificial General Intelligence, Virtual Reality, and other such technological inventions giving rise to marginal unemployment. According to the predictions, by 2050 the number of senior citizens or elderly people is going to be approximate of 2.6 billion. For the same reason, the need for robots built out of Artificial Intelligence shall be on the rise for such people in a way that such people can receive automated assistance rather than manual. 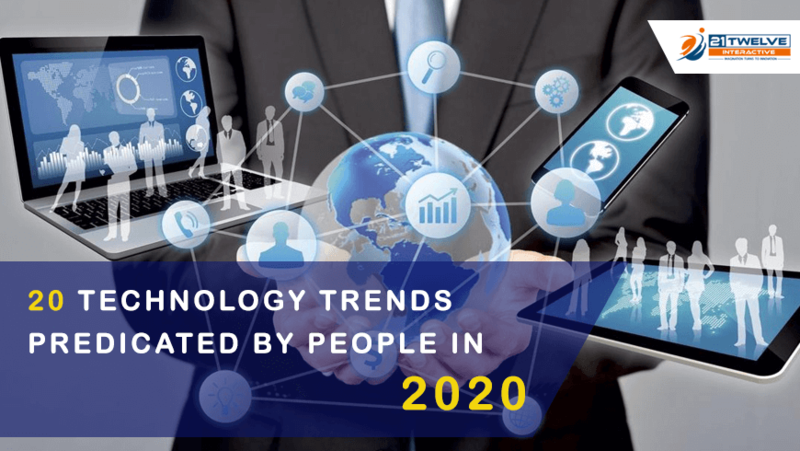 These are some of the future technology trends 2020 which shall enable users and entrepreneurs to stay prepared with gadgets such as tablets, phones, and laptops to make use of advanced technology. The future is seamless and hassle-free in terms of technology and development and people should make most of it. This shall also be applicable for future technology 2050.